Here at Ski Basics we pride ourselves on going above and beyond to ensure that our guests get the best value for money whilst experiencing the very best skiing in the Three Valleys. We have impeccably high standards and our reputation for exceeding guests’ expectations is unparalleled. We work hard to ensure that each an d every guest enjoys their affordable ski holiday in Meribel before leaving the resort feeling relaxed and refreshed (and desperate to book again for next year!). Our Plus+ Service not only offers exceptional comfort, impeccable service and fabulous locations to ensure your ski holiday in Meribel is seamless, but we also know that the little luxury touches you crave need to be affordable. This is why many of our plus+ chalets are new-builds and are “ski in ski out”, and why every cosy bedroom in the plus+ chalets is equipped with a mo dern en suite bathroom and fitted with a luxurious sauna or steam room for you to relax and unwind in after a hard day on the slopes. From helping you with your luggage to keeping your chalet bright and sparkling clean, you can rest assured that your ever-bidding chalet hosts will ensure that won’t have to lift a finger for the week. We are delighted to share with you the news that we now have a new luxury bathing range across all our gorgeous Plus+ chalets. Ski Basics are proud to partner with the beautiful Orla Kiely brand, and guests will now find this luxury range of shampoos, conditioners, body lotion, shower gel and soap bedecking the bathrooms in each of our plus+ chalets in Meribel. Orla Kiely is an Irish contemporary designer known for her unique retro prints and designs. Since the company’s conception in 1995 (starting with Orla’s love of all things mid-century and the iconic ‘stem print’ design), the award-winning designer Orla Kiely now represents a global lifestyle brand. The company designs everything from stationary to homewares, home fragrance products and of course, the beautifully-fragranced bath and body range which will grace the bathrooms of our Plus+ chalets. 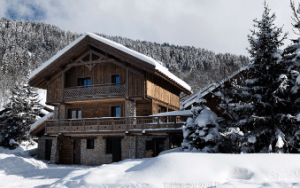 This addition will make your ski holiday in Meribel just that little bit more luxurious and satisfy your senses. Hopefully leaving you refreshed and ready for the day’s skiing! The Orla Kiely range uses a blend of essential oils with marshmallow extract and pro-vitamin B5 to help soothe and soften the skin, leaving skin feeling refreshed. We know that you care about the well-being and health of your family, so the range is also free from parabens, sulphates, petrochemicals and artificial colourings. As one famous brand once said, it’s because you’re worth it! 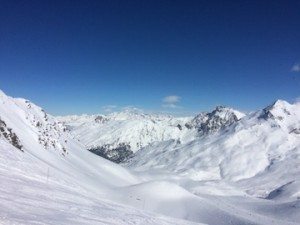 We can’t wait to welcome you and ensure that you wholeheartedly enjoy your next affordable ski holiday in Meribel with the team here at Ski Basics.